PSC department is looking to recruit fresher Indian candidates for the vacant positions of Motor Vehicle Inspectors in Gujarat state. Gujarat Public Service commission department issued an official notification in the PDF format on their official departmental website. This PDF file is in Gujarati language only. Here we translated that PDF file in English language and shared with you the information about that PDF file. You can check the official PDF file under IMPORTANT LINK section where we shared the link of PDF file as well as the link to apply online. 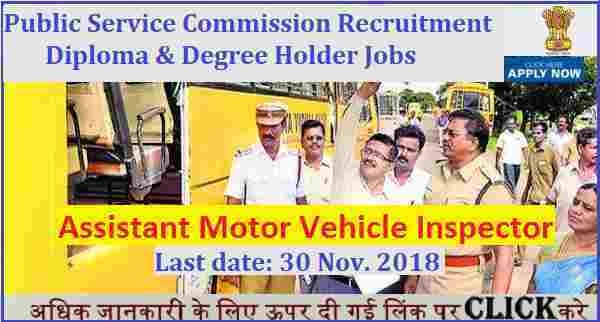 For more information related to these Govt jobs for Motor Vehicle Inspectors is given below in this article. So read this whole article carefully before applying online through the official website of the department. Pay Band: Not specified in the PDF file. Those who have a Degree in Mechanical engineering or Automobile Engineering can apply for this Motor Vehicle Inspector jobs. Should fall in the fallowing age criteria of 19 years to 35 years for applying these Govt jobs. Paying Method: Applicants can pay the above application fee which we mentioned in the table through the following ways: “ Through Challan OR Net Banking OR Card Payment”. Those who satisfied all the eligibility conditions which we mentioned above in this article can apply online for these Government jobs for Motor Vehicle Inspector posts. The link is already activated for applying on 15th Nov. 2018 and this link will remain activated up to 30th Nov. 2018. So all the applicants have to apply between these dates. There is no other process for applying these Government jobs. So follow the IMPORTANT LINK section at the last of this post for more information. 15TH Nov. 2018 is the Opening Dates.